Why Might You Need a Hearing Aid Dehumidifier? Your hearing aid is very important to you. It improves your quality of life and may be essential to earning your living. If you bought your hearing aid you paid hundreds, even thousands for it. You want it to work as it should, and last as long as possible. Modern aids are sophisticated, using the latest in miniaturised electronics, and often "made to measure" to fit each user's ear perfectly. As a result they are delicate instruments and their performance can be easily downgraded by the places in which they operate. Your ears, and mine, represent a hostile environment, containing moisture and wax, things we can't control. Our ears move in a larger world full of other potential threats to hearing aids, although we have rather more control over which of these we expose them to. No doubt your audiologist or hearing aid supplier gave you advice about day to day care when you first had a hearing aid fitted and informed you of how often you should return it for professional cleaning and other maintenance. She will have talked about wax, which causes around 80% of faults, explaining the need and procedures for daily cleaning. She will have talked about heat, about not using a hair-drier without first removing your instrument, or even leaving your hearing aid exposed to direct sunlight for any length of time. You will also have been advised about the damage that can be caused by chemicals, mainly found in hair sprays, perfumes, cosmetics and deodorants and the precautions you should take to avoid this. Last, but not least, you will have been told all about the damage that can be done by moisture. Obviously accidental soaking, or total immersion in water is to be avoided. Taking a shower without removing your hearing aid is an understandable mistake to make. I haven't done it with my hearing aid yet although I have found myself under the shower with my eye glasses on a couple of times, so I know how easily it can be done. If your hearing aid has been accidentally "drowned" please do not use any strong heat source to dry it out. I have seen some cases where using a hair-drier has been recommended. This is not advisable. Putting the hearing aid in the microwave is a definite no no! A good plan is to remove the battery and leave the battery door open. Remove any part of the instrument that is normally removable and use your air puffer to remove as much water as possible from any component you usually clean this way. If you have a hearing aid dehumidifier put everything inside and then seal it. Once it has dried out it is advisable to take it to your original supplier and have it tested. With any luck, plus your prompt action, it will all be in working order. Leaving aside accidents your hearing aid is still vulnerable to damage from small amounts of water to which it is exposed. All hearing aids are vulnerable. If they were fully water-proofed they would also be air-tight, so sound waves would not be received in the instrument. First, it can degrade performance even without permanent damage. Water condensing inside ear-mould tubing makes the bore, or diameter of the tube slightly smaller. This increases the pitch of the transmitted sound and changes what is heard. If you think about a pipe organ, there may be one in your church, the higher notes come from the narrower pipes. The amount of water we are talking about is small but can affect significantly the quality of the sound you hear. This is one reason hearing aid cleaning kits usually come with an air puffer to blow the water out. Second, it can damage the components of the hearing aid to the point where repair or replacement is the only option. There two strategies we can use to control this. We can stop some of the water getting inside in the first place, or we can remove it once it is inside. One source of water entering our hearing aids is from humidity in the air. Apart from being careful, not taking the instrument into the bathroom, removing it while cooking etc., there is little we can do to prevent this. Most hearing aids are designed to cope with the day to day humidity encountered in every day life although steps should be taken to dry out the instrument over night. A second source is, well, "glowing" if you're a lady, "perspiring" if you're a gentleman and "sweating" if you're a horse. Among the partial solutions are latex covers which can be placed over the hearing aid. A popular brand is known as "Super Seals". As with any barrier it cannot cover the microphone so it cannot prevent water ingress completely. The "Hearing Aid Sweat Band" is like a tiny sack that fits snugly over behind-the-ear hearing aids to protect them from sweat during periods of physical activity. For young children, especially those new to hearing aids, and those with developmental delays there is "Ear Gear", a system to protect the hearing aids from damage and loss. The hearing aids are enclosed in a protective cover and, particularly for youngsters, attached to the clothing with cords so they can't be lost. This product is also used by adults, usually without the (optional) cords, particularly if they spend long periods in a humid environment or are physically active. Finally there is the good, old fashioned head band, made famous by the exceptional Lawn Tennis player, Bjorn Borg. He wore it to stop sweat running into his eyes while running about the courts at Flushing Meadows and Wimbledon. For wearers of hearing aids it serves the same purpose, but also keeps the sweat from running onto the aid. It is generally accepted that hearing aids need to be kept as dry as possible to extend their lives and optimize performance. Following the cleaning instructions given by the audiologist, hearing aid supplier and/or manufacturer is essential. It is also recommended, as a minimum, that while the aid is removed for sleeping the battery cover should be left open so that ventilation and natural drying can occur. It is a good idea to leave the hearing aid in a room where no one is sleeping, especially if the bedroom is small. Water vapour exhaled during breathing can raise the relative humidity appreciably, especially in a small bedroom or one in which more than one person is sleeping. Beyond this simple ventilation many audiologists recommend the use of a hearing aid dehumidifier. This may be a good idea in any circumstances but its value increases further if the hearing aid is exposed to high levels of relative humidity in the room in which it is left over night. If the relative humidity is too high little or no water will evaporate from the instrument. If the "dew point" is reached water may actually condense on the aid, which will be cooler when not in use than when being warmed by the wearer's body. Please don't forget to remove the battery before putting the instrument in the hearing aid dehumidifier to avoid shortening battery life. All hearing aid dehumidifiers consist of a sealed container. This may be a pouch or something a little more robust. The sealing is essential and if you forget to seal it the dehumidifier will not work. Hearing aid dehumidifiers work in a variety of ways. One of the least costly ways is to put desiccant crystals in the container to dry the small volume of air and, thereby, the hearing aid. Examples are Dri-Aid, Super Dri-Aid, Dri Doc and Dri-Eze (not to be confused with Dri-Eaz) seen below. The advantage of this type is its low purchase price. The disadvantage is the low water extraction rate of this simple hearing aid dehumidifier which some users have found insufficient in particularly humid conditions. If you select this type please ensure that the crystals can be regenerated, by heating, when they are saturated. Dri-Eze for example recommends replacement of its hearing aid dehumidifier after six months which can make the low initial purchase price less attractive. You can improvise this kind of hearing aid humidifier by using a small glass jar with screw top, purchasing the desiccant, which is widely available, and placing a pad, ideally of foam rubber, on top of about two inches of the crystals. The pad acts as a safe surface for the hearing aid and separates it from the crystals. Ensure that you only buy approved desiccants; we recommend silica gel. Some desiccants, such as calcium chloride, are caustic when saturated which can damage not only the hearing aid but also its wearer! Handled properly this can be managed but we would strongly urge against its use by amateurs. 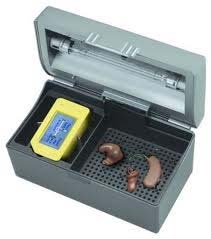 At the "high end" of hearing aid dehumidifiers is the "Dry and Store" This system use an ultra violet lamp to kill bacteria, thus deodorising the instrument, gentle circulated heat to draw the moisture into this air and a desiccant to absorb the moisture. The desiccant has to be replaced every couple of months so this is an added cost. The advantages of this hearing aid dehumidifier are its comprehensive and effective dehumidification, the bonus of killing odour producing bacteria and the capability to hold several hearing aids at one time. The top of the range model will hold a minimum of four instruments and more if they are of a smaller type. Its greater effectiveness also makes it suitable in the event of an emergency dry-out after soaking or immersion of the hearing aid. The disadvantage is the cost, around $150 for their top of the range hearing aid dehumidifier, less for the smaller models. If you live in a household where several hearing aids are in use, your climate is humid and you are accident prone this may be the dehumidifier for you. It may be too expensive for your needs but if you simply want the best, regardless of cost, there is no doubt this is a superior hearing aid dehumidifier.